For experienced backpackers, the process of putting on a pack is probably second nature. 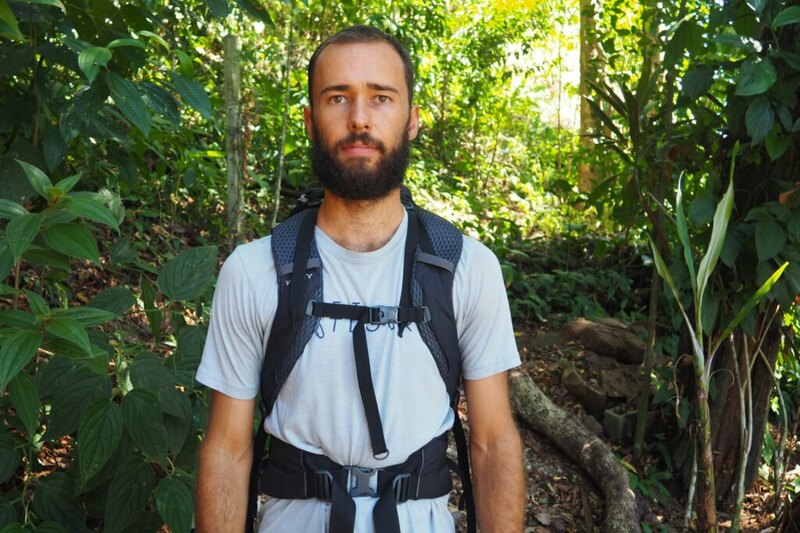 But for all of you just getting into backpacking, it’s important to know that there is actually a preferable technique for putting your backpack on and adjusting it for comfort. In this article, I’ll cover some easy tips for how to put your backpack on properly. Side note: Once you’ve learned how to put your backpack on properly, be sure to investigate the articles in my Hiking Tips and Trails section. Check out my Outdoor Gear page for reviews on water filters, tents, hiking shoes, trekking poles, and more. Also, check out my Backpack Reviews, including brands like Kelty, REI, and Gregory, if you’re in need of a new pack. Finally, my YouTube Channel is full of informative video content if you’re not really into reading! When your pack is fully loaded with food, water, camping gear, and cookware, it’s usually going to be pretty heavy. While it’s recommended that your total pack weight never exceed 1/3 of your body weight, I know from experience that it’s easy to go over this recommended limit. When your pack is at its maximum weight, putting it on and taking it off are the two times when you’re actually most susceptible to injury. That’s why it’s always preferable to use the buddy system when putting on and removing your backpack. 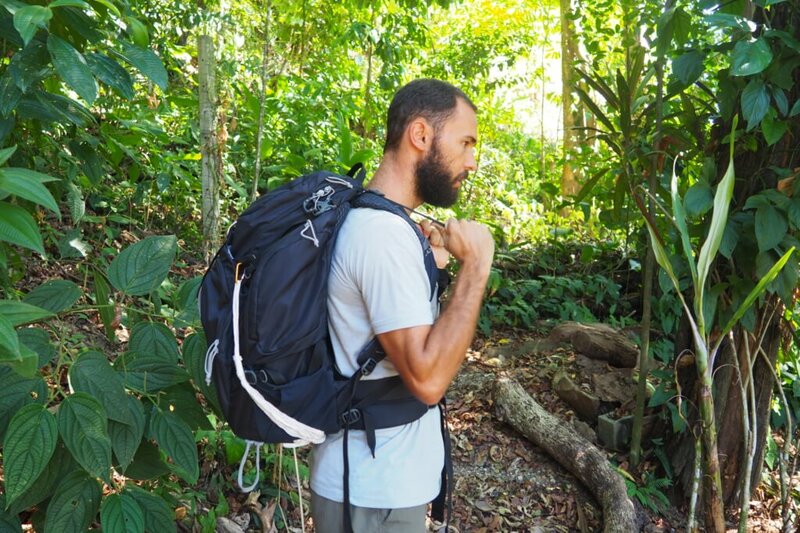 Putting your backpacks on one-by-one and assisting each other in the process can eliminate a lot of the strains that can occur from twisting or contorting your body in an unfamiliar fashion to get your pack’s weight situated on your back. This tip shouldn’t be underestimated. Over the length of a long thru-hike, having a friend help you put your pack on can make a huge difference. If you’re hiking solo or if you can’t find a reliable friend to help you lift your pack onto your back, you can always use a convenient table at the trailhead or find a flat rock to support the weight of your pack as you get the hip belt adjusted. Once you’ve found a friend, position yourselves so that you’re standing on relatively flat ground with your pack standing in between the two of you. Obviously, you should be positioned on the side of your pack with the shoulder straps facing you. Before you begin lifting your pack, take a second to loosen the shoulder straps so that it’s easier to slide your arms through them. Coordinate your count so that you lift at the same time, using your legs to lift the weight instead of placing an unnecessary burden on your back. Ask your friend (nicely!) 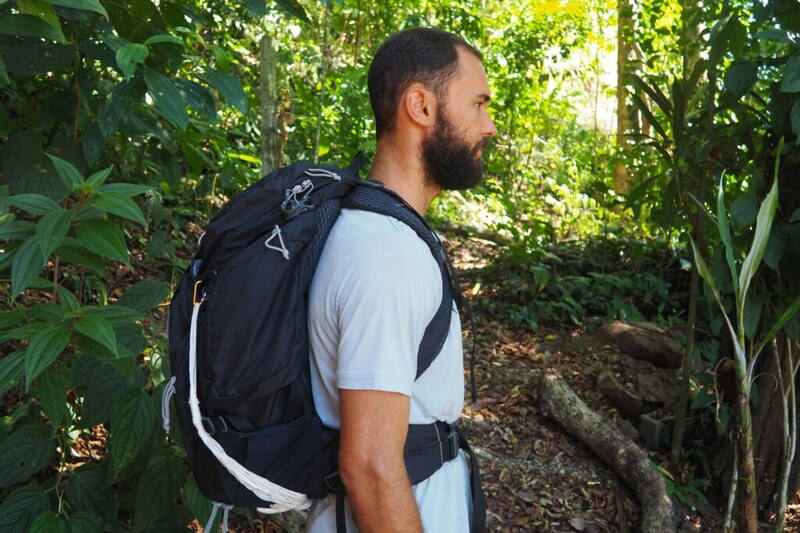 to hold the majority of your pack’s weight as you slide your arms through the shoulder straps and locate your pack’s hip belt. Many people skip over the hip belt and move right to tighten the shoulder straps. In fact, it is the hip belt that should be adjusted first. Find your Iliac Crest and position the hip belt above this area. Very simply, your Iliac Crest is located at the top of your hip bones. Your pack’s hip belt should rest on these large bones, which often results in the belt’s buckle resting over your navel. Tighten the belt down so that it doesn’t slide down once your friend has stopped supporting the weight of your pack. Once your hip belt is tightened down, it’s time to adjust your shoulder straps. Because you loosened them earlier, it might feel like your pack is pulling you over backward at first. 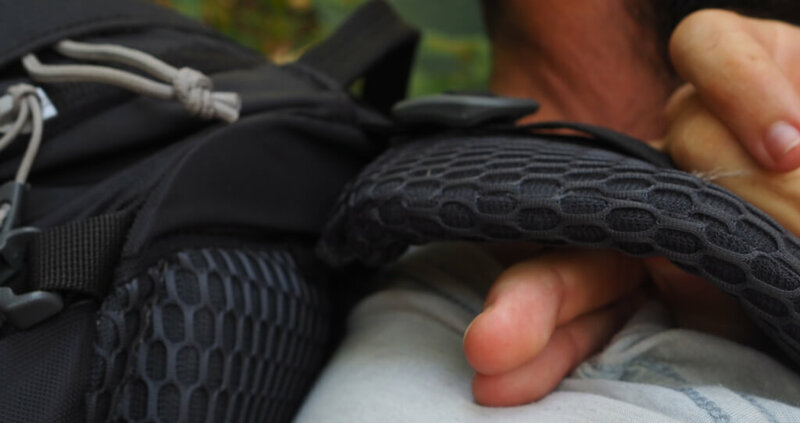 When you tighten these straps down, it’ll move the weight of your pack closer to the middle of your back and in better alignment with your body’s center of gravity. It’s important to find a happy medium between tightening up your shoulder straps too much and allowing them to be too loose. As I mentioned above, straps that are too loose will cause the weight of your pack to sit too far back. This can throw off your balance and cause your body to work overtime to move inefficiently. But, on the other hand, tightening your shoulder straps too much can result in uncomfortable pressure on your shoulder and pectoral muscles. Your pack’s load lifter straps will be located above the shoulder straps. 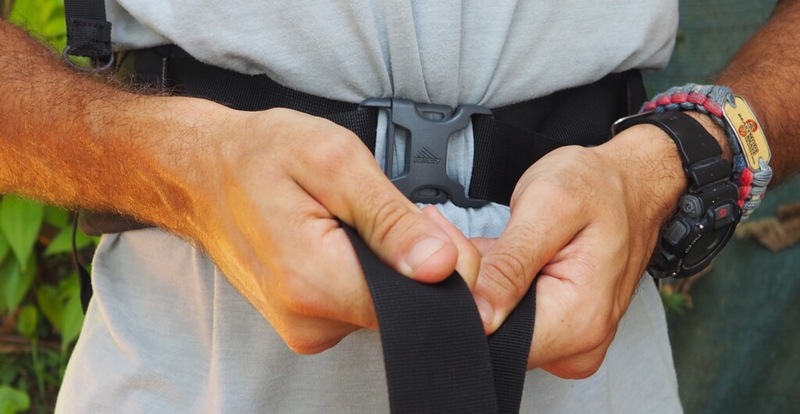 In effect, these straps connect the tops of your shoulder straps to the body or brain of your backpack. 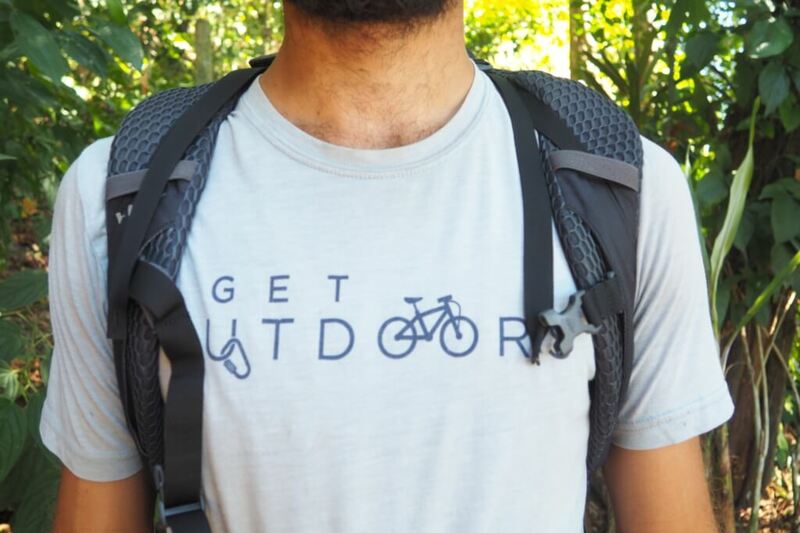 When you tighten them, it pulls the body of your backpack upward and helps to align more of your pack’s weight over your hips. 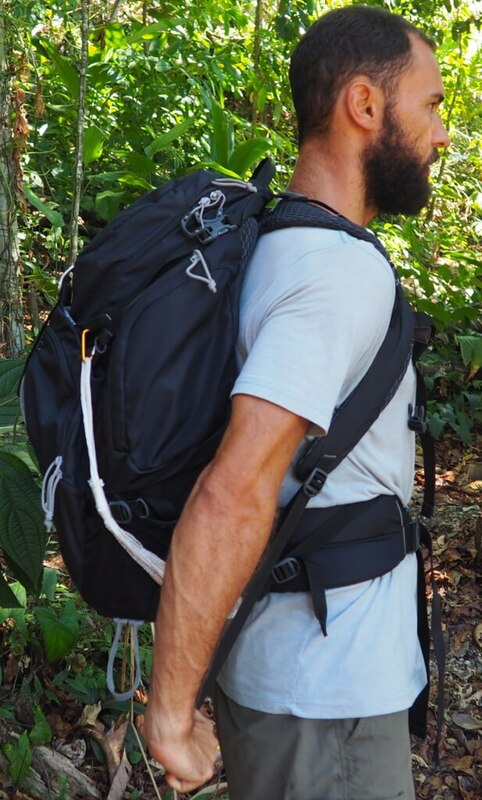 These straps are a very useful tool for making sure the weight of your pack is carried by your body’s largest bones and strongest muscles, which are located in your hips and legs. When your shoulder and load lifter straps are adjusted properly, you should be able to slide at least two fingers (positioned horizontally on top of one another, as pictured below) between the top of your shoulders and the straps. Taking stock of whether this bit of “airspace” exists or not will help you make sure that the bulk of your pack’s weight is indeed sitting on your hips, which is where it should be. Finally, click the sternum strap together and tighten it down according to your personal comfort level. 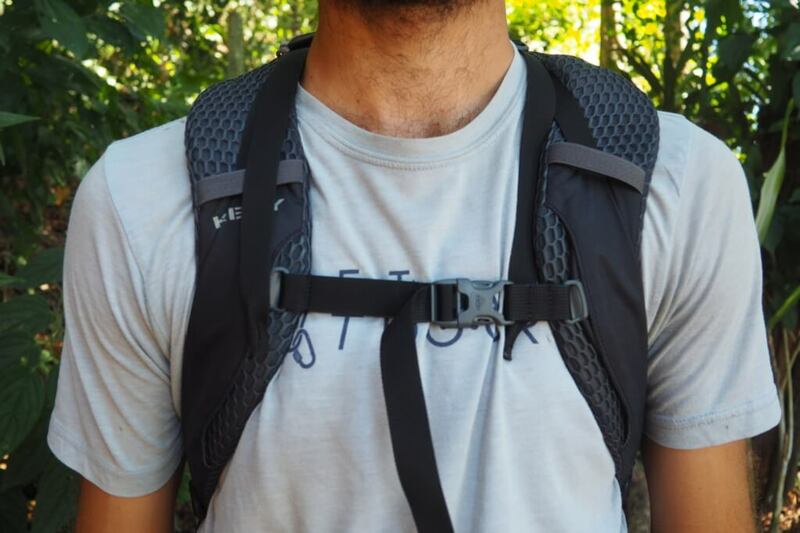 Ideally, the sternum strap should bring the shoulder straps of your pack slightly closer together. In doing so, this takes the pressure of those straps off your shoulder muscles and moves it onto the exterior portions of your pectoral muscles. One of the benefits of pulling the shoulder straps together is that it allows your arms to move more freely as needed. 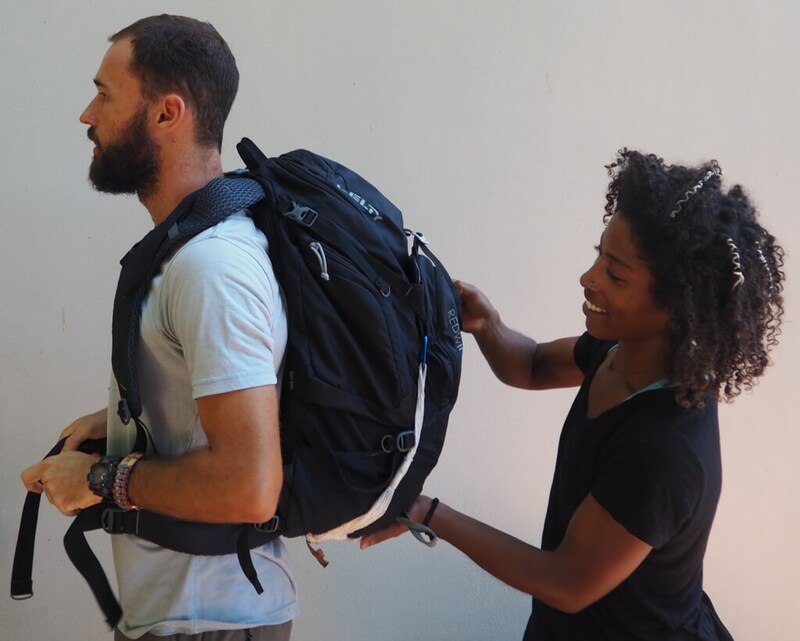 While this may seem like a comprehensive process to go through every time you put your backpack on, it’s important to run through it so that you find the most comfortable placement possible for you in that moment. It’s important to remember that your body will change and adapt as you hike. As such, it can be necessary for the placement and alignment of your backpack to adjust in turn. 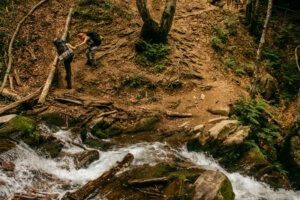 Once you run through this process, starting from the hips and moving up through the shoulders, I recommend that you go back and run through everything once more before you start hiking. In some cases, your hip belt might feel much looser once you’ve adjusted all the other straps. You’ll often need to micro-adjust to make sure the weight of your pack is sitting comfortably on your hip bones. Learning how to put your backpack on properly is all about comfort. No amount of epic scenery can make up for a pack that just isn’t comfortable. Taking the time to adjust your pack properly every time you put it on will help you find a comfortable fit so that you CAN enjoy that scenery. Do You Know How to Put Your Backpack On Properly Now? I hope you’ve enjoyed these recommendations for How to Put Your Backpack on Properly and I’d love to hear your feedback in the comments section below. I’ll be quick to reply to any questions, comments, or concerns you feel like sharing! 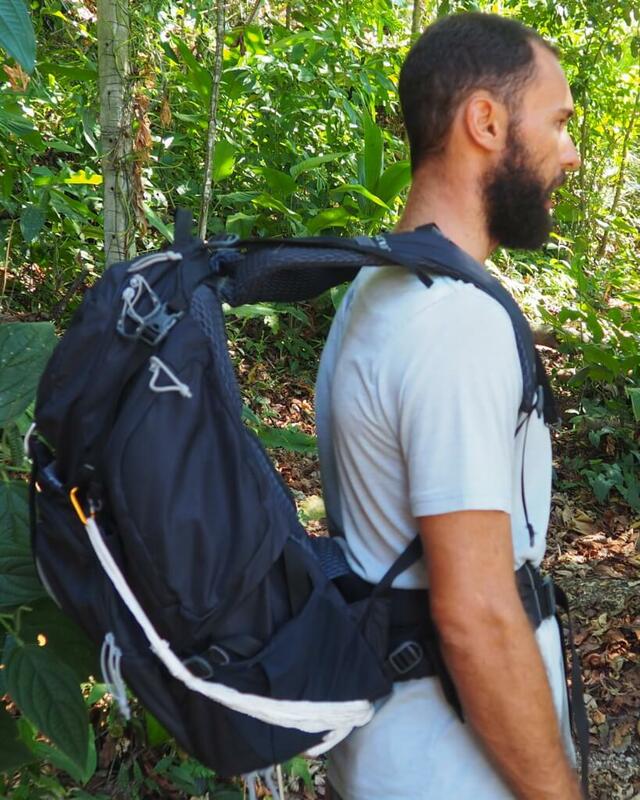 Nice article about putting in backpack properly. 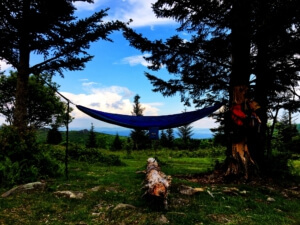 I love hiking and therefore I could use a little tip about backpacking. Getting it right always helps me because I noticed whenever it’s not backed properly, running seems not to be an option. I’m gonna bookmark this post to share with few of my hiking friends. Great post. Thanks for the comment and I’m really glad you found it useful. Please do share with any friends or contacts you think will find it useful as well. And I’d love to hear how the tips improve your comfort on upcoming adventures! Reading this article I feel guilty of how I have been carrying my backpack. Most time I don’t put it right where it should be and how don’t know how to adjust it. Most times when the backpack is over load I use one of my shoulder to carry it which is wrong from what am reading from this article. Thanks for this eye opening article. I will feel more comfortable now carrying my back pack the right way it be. Hi There! The post was not intended to make anyone feel guilty! I just wanted to provide a simple template for how to put your backpack on properly every time so that you can be more comfortable and enjoy your hiking/backpacking adventures that much more. 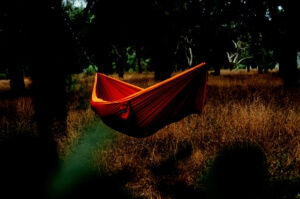 I hope you’re able to apply these tips for greater comfort on the trail! Thanks for this very informative article on how to put on my backpack the correct way. To be honest, I never gave it much thought. I noticed recently that I experience terrible back pain whenever I use my backpack (I always go around with my laptop and working materials). My style was to use only one of the straps ( The one on my left shoulder), just like you illustrated with the opening image. This is far too common among guys. The illustration actually shows the proper way to put on my backpack. In this way the pressure will be evenly distributed and not lead to back strain. Do you think it is safe for someone with a protruding belly to use the Hip Belt? I have been guilty of carrying my pack in that way in the past too! I would absolutely say that it is safe for all individuals to use the hip belt. Packs that come with hip belts design them to be highly adjustable so that they fit a wide variety of body types! Glad to hear it. Looking forward to hearing about how these tips make your future adventures more comfortable and enjoyable! Hi Tucker, I must say that this article is kinda specifically written for me. I make use of backpack quite often, not only that, I oftentimes exceed the recommended limit. Prior to reading this article, I don’t really give a thought to how I put on my backpack. But your article is an eye opener, and makes a lot of sense. Both starting with the hip belt, adjusting shoulder straps, down to finishing with Sternum strap, makes it simpler to carry out the process. I can categorically say that I now know how to put on my backpack properly. Beautiful! That was, of course, my goal. I hope you take the time to peruse some of the other tips and reviews on my site when the need arises! It’s really interesting reading on how to put on my back pack on. You really did a great job in sharing this. I use to wear my backpack anyhow in haste. But with this steps you shared I can now wear it the right way first telling my fiance to help me with it and other steps to follow. Thanks for sharing this article. Absolutely! If you’re looking for any additional tips, trail recommendations, or reviews on backpacks or outdoor gear, be sure to peruse around my site for a bit. If there’s something specific you’re looking for that you can’t find, feel free to reach out and let me know. I’ll add it to my creation plan! Wow, when I first read the title of this post I thought it was a joke. But I now know putting your backpack on incorrectly can cause problems and I guess it happens enough for it to be considered while hiking. I’ve only been hiking a few times and I never noticed any strain on my back from taking it off and putting it on. What do you think about putting the backpack on an elevated surface like a table and then backing into it to put it on and tighten up? That is the best way to do it if you don’t have a partner or a friend! Great call pointing that out. I have even used flat rocks at a convenient height in the past. I’m going to take a second to add a quick snippet about a recommendation for how to get the pack elevated if you don’t have a friend to help. Thanks! I once went on a 2-day hike with 1 overnight stop with a youth group which started well, by the first evening my right knee was getting very painful, and by the second afternoon I was in agony and somebody else had to carry my gear. The backpack I had was an old army surplice with only shoulder straps and a hip strap. There was no instruction on what to do, so we just hitched it up and moved around until it felt right, and off we went. Was the equipment at fault or was there another problem? It’s a pity we didn’t have the advice and equipment back then, that you show us here, which makes things a whole lot easier. Hi Robert! I’d imagine that your issues could’ve been slightly related to the older equipment, but my father always told me “it’s a poor workman who blames his tools!” As I get older, I find that to be true in almost any case. Either we need to improve our ability to use the tool or, in some cases, we need to realize that the tool we’re trying to use isn’t the right one for the job and, then, we must be responsible for finding the right tool! I hope that the tips I’ve provided in this article will help you fit up your backpack comfortably on your next hiking/backpacking trip! I actually pulled a muscle the other day taking off a backpack. This article, this information – all really, really useful stuff. I for a fact didn’t know that there goes so much thought into it. Nobody taught me this until now. I mean I used to think it’s just strap it all on, tighten where you feel necessary and go. Thus, I’m really glad I found this before getting into some type of major injury. Thank you for all the insights, I deeply and sincerely appreciate it, Tucker! Oh no! I hope it was only a minor muscle strain and that you’ll be back on the trail in no time! Such an incredible guide, Tucker! Glad I took a look at it before actually trying to put on a backpack. And I just must say that the pictures you provided were so, so helpful. Really helped to make sure that I understood the text correctly. Thanks Rasa! I’m really glad you found the pictures useful. I knew it would be helpful to provide visuals to back up the text. If you’re looking for any outdoor resources that you can’t find on my site, drop me a line and I’ll include it in my content plan!